JOINT operatives of the Philippine National Police (PNP) and Armed Forces of the Philippines (AFP) discovered Sunday, March 17, a "encampment" and marijuana plantation of the New People’s Army (NPA) in Sarangani. Police Regional Office-Soccsksargen Director Brigadier General Eliseo Rasco said joint elements of the PNP, AFP, and Philippine Drug Enforcement Agency conducted an anti-illegal drug operations against members of the NPA, led by a certain Toto and Dandan Navarro, who are allegedly cultivating marijuana plants in the hinterlands of Barangay Nalus, Kiamba in Sarangani province. Rasco said the operating units move toward the area, where they encountered an unidentified number of NPA rebels. The clash lasted for 15 minutes. The enemy then withdrew. There was no casualty on the government side, said Rasco. 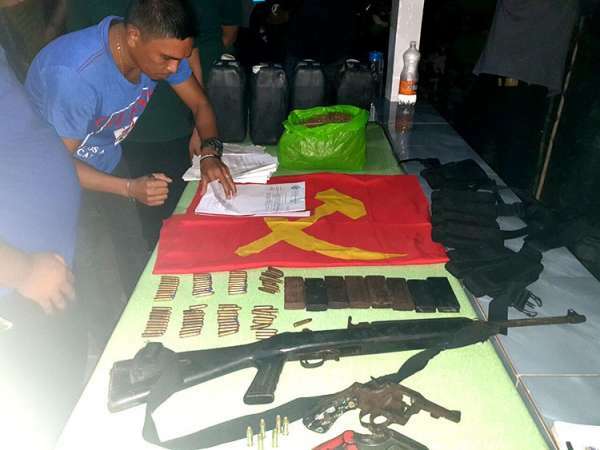 Seized during the operation were one unit of caliber .30 carbine rifle, two units of caliber .38 pistol, one bandolier with eight magazines and 81 caliber .30 ammunition, subversive documents, and one NPA flag. Rasco said the NPA rebels may have been using the encampment as a training and plenum area. In a follow-up operation around 3 p.m. Sunday, March 17, troops found the marijuana plantation. The plants, however, have already been uprooted based on the traces of marijuana plant holes and presence of dried plants with stalk, leaves, and seeds.